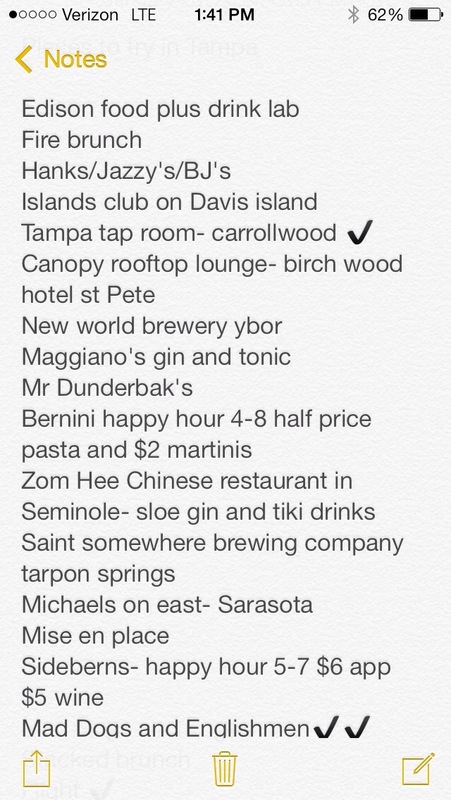 I have a Tampa restaurant bucket list on my phone. No, I’m not kidding. I make lists for everything, because there are sooooooo many things I want to do. I would never remember them all. Part of my list. Yea, it’s pretty long. I’m ambitious. So whenever anyone wants to go out to eat, I always refer to my list. And yes, I put a check mark next to the places I’ve tried, or I’ll forget that I’ve been there. I met up with my two girlfriends Hannah and Lisa for lunch at Restaurant BT last Thursday. We arrived right after they opened and had the place to ourselves, save the staff. There are two smallish dining areas. The decor is fabulous. The white, earthy scheme makes you feel very calm and tranquil. I would seriously love to decorate my house just like this! 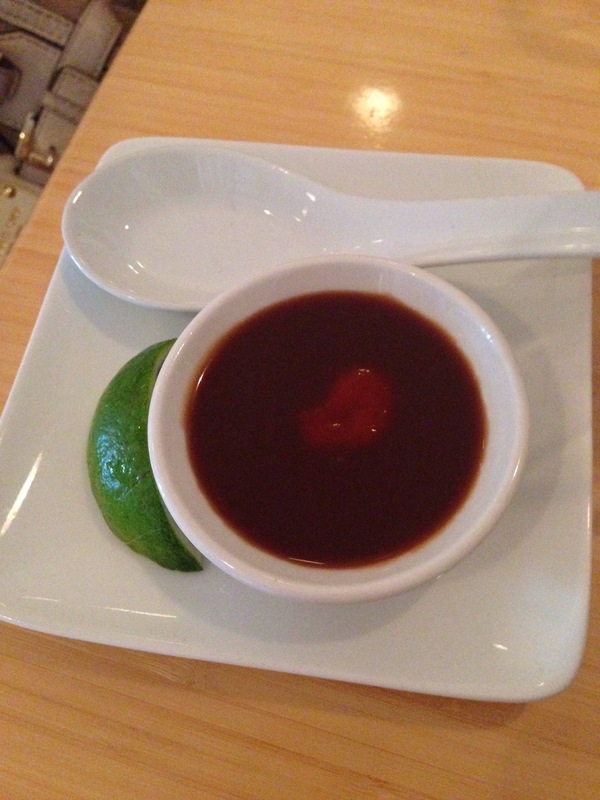 I ordered the chicken pho, It came with a little bowl of sauces, so you can determine the amount of spiciness you want. I really appreciate when restaurants do that because I like my food really spicy (must be the Buffalonian in me). 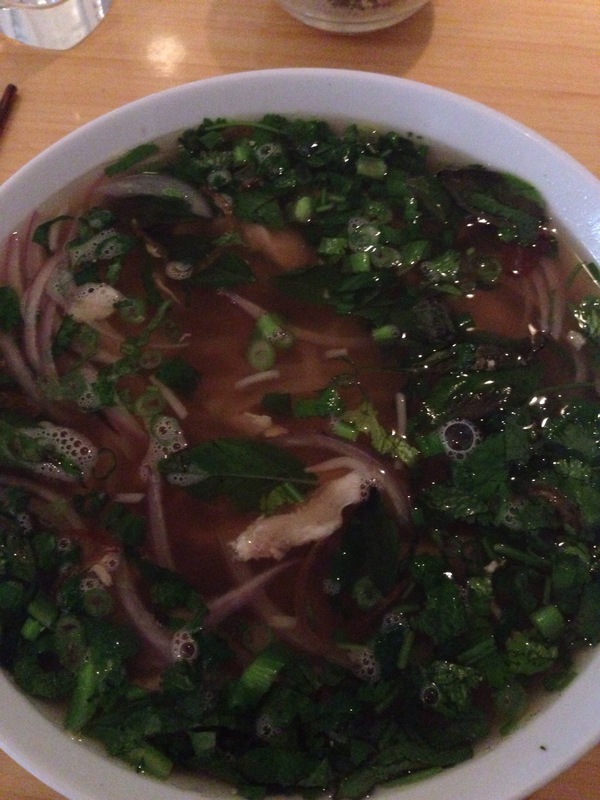 My chicken pho was amazing. It had such a delicious flavor and was sooooo much food! The chicken was cooked perfectly and the broth was delicious. There was just the right mix of crunchy and liquid. And the best part, we went on a cold day so this was the perfect lunch choice! Hannah ordered the fresh rolls. They looked super delicious. We learned from the waiter the difference between cilantro and culantro. Although they are plant cousins, they are nothing alike. Which was good for Hannah, since she hates cilantro. 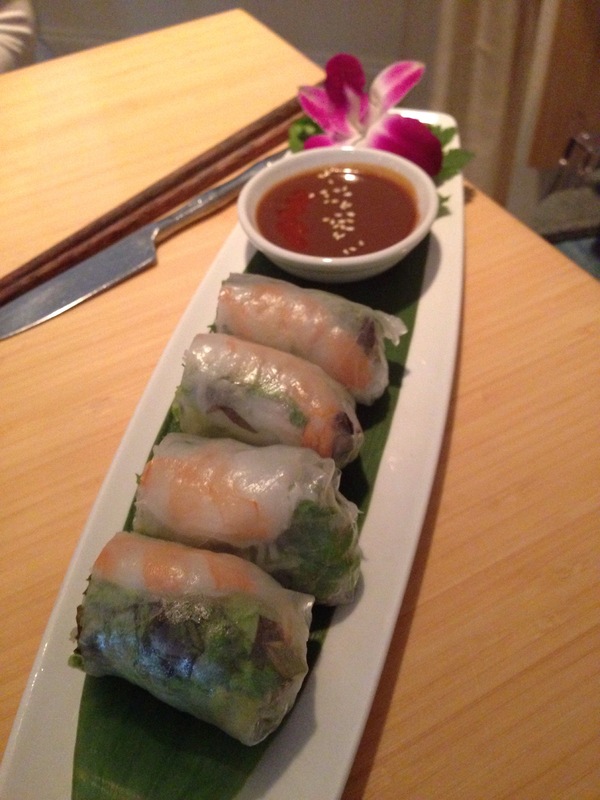 Fresh rolls, which actually have neither cilantro nor culantro in them. 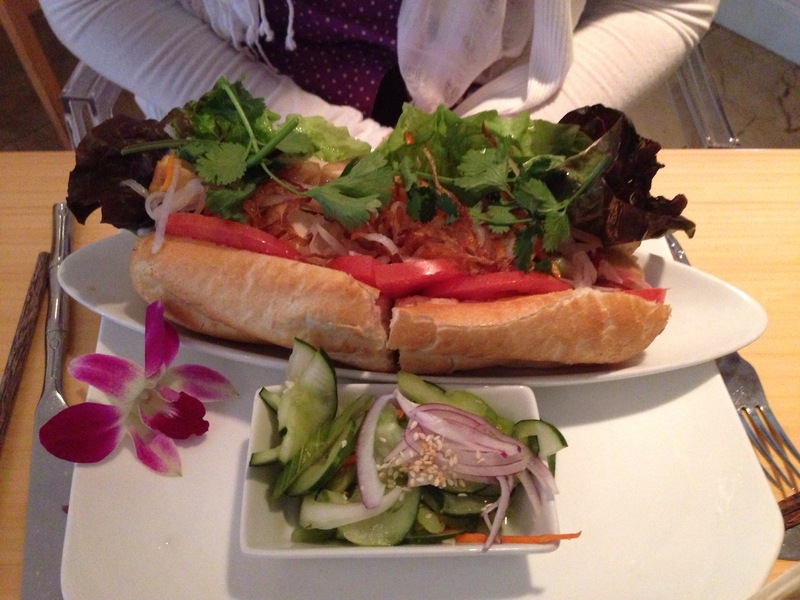 Our resident vegetarian Lisa had the tofu sandwich on a baguette. It was a huge sandwich and looked fantastic. It was nice to go to a restaurant that actually had tofu as an option. Everything we had was super good. 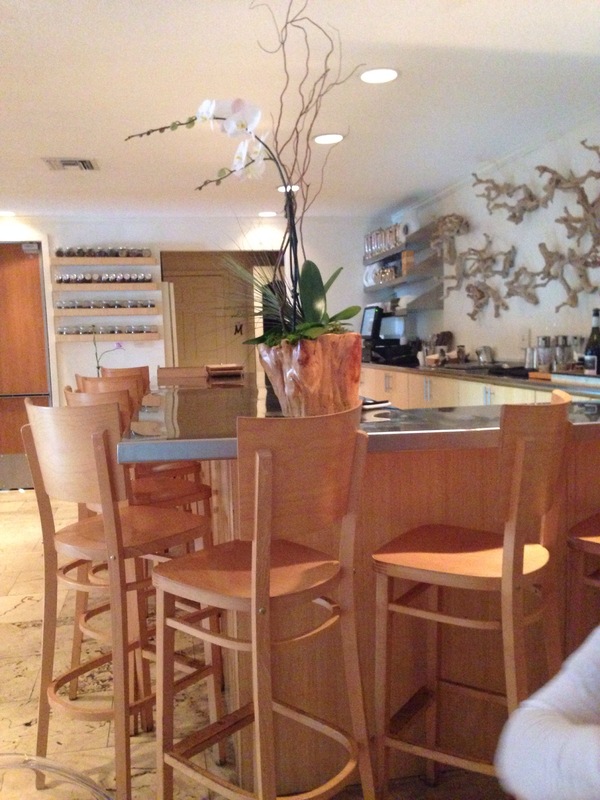 The ambiance was pleasant and the service was quick. They were always quick to refill our water glasses. The food was really fresh and had perfect flavoring. I’m really glad I finally got to try it out and I can’t wait to go back again. Any Tampa restaurants that I should add to my list? That veggie sandwich hit the spot! Great new place for ladies who lunch!